All Star Bronze offers special pricing on bronze and aluminum cast seals in the most common military and government designs, including Army, Navy, Air Force, Marines, Coast Guard and Merchant Marine, as well as state seals. Multi-color seals can also be produced with an additional charge. 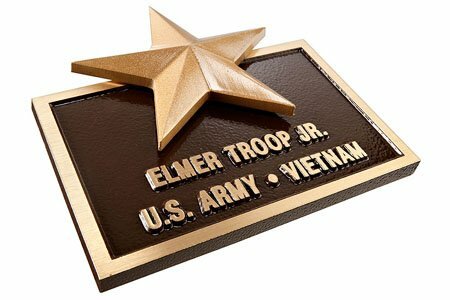 Whether you’re dedicating a military building, creating a veterans memorial in a park or identifying a military base or ship, All Star Bronze will create a plaque befitting of our armed forces and veterans. Whether it’s for the Army, Navy, Air Force, Marines or Coast Guard– we will create a custom plaque with your branch’s seal and information. All Star Bronze plaques are guaranteed for life. War Memorial Terrace project in Rochester, NY.